Last week, I sat down with my students to write in my journal along beside them. The prompt was, "Why do you like to write?" I discovered something about myself. I really enjoy journal and blog writing; I enjoy writing non-fiction. I don't actually like or enjoy writing fiction, stories. However, I find that I have the skills and the interest in setting myself a CHALLENGE to write fiction. I enjoy the challenge of writing different genres and writing for different media. I just don't actually have stories that burn to get out, that must be told. I often amuse myself with stories, but they are more like mental distractions. That gem of information came up while journaling with my students. I shared it with them, and it led to a really nice discussion on writers, likes/dislikes, and our insecurities. It brought forth one of our best discussions, and I'm thankful for that moment. I think the kids needed it, and I plan to include more time for sharing all of the the feelings we go through as writers. What kind of writer does it make me if I don't have stories that must be told? That prompted me to have discussion with my mom about discipline and my lack of it. I told her that not having discipline was one of the great struggles I face. She was surprised. She was sure that I was one of the most disciplined people she knew....if I ever found something I wanted to do, nothing could deter me, nothing could stop me. Yet, I explained that driving passion is not the same as discipline. I've been in a beauty pageant; I've won many types of competitions; I've successfully completed an Adventure Race; I've raised my daughter as a single mom, and so on. Yet, I reminded my mom of my days practicing piano - there were times when my parents begged me to stop practicing for some peace in the house. There were also days that we fought because I didn't want to practice. SELF-discipline is that trait that will sit you down to write (or practice an instrument or clean house) when you really don't want to. 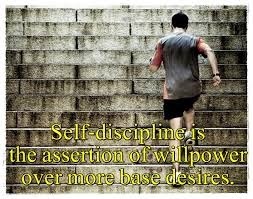 Self-discipline will keep you going when you have a million other things you'd love to do or could be doing. I don't have that. And when my life throws me a curve (especially lately), I'll simply retreat to my bedroom, distract myself with the internet, and/or nap. What kind of person does that make me if I don't have self-discipline? This is the good part... and now I'm merging life coaching on my writing blog... at least I'm not asking myself destructive questions! Even if I don't have the answers to those questions and I'm still discovering myself, I am asking better questions! Let me explain: you can set yourself up for success or failure by the questions you ask yourself. If you ask yourself, why am I such a failure, your brain WILL answer that question. Such a negative question will elicit a negative answer. When you ask yourself better questions, your brain will answer with better answers. Where do I stand on self-discipline? I'm still working on it. I've found that I do a much better job when I have a buddy - when I have a walking buddy, I walk more often. When I have a writing buddy, I write more consistently. I also work better when I have deadlines. My writing group is keeping me somewhat disciplined because I have to submit something once a month for review. And now I loop back to my original thoughts on writing and enjoying it. Maybe I just embrace it all as is and move forward. I'm still not sure what it means for my writing. Right now, that's ok. Your thoughts? 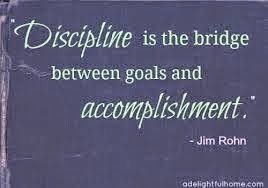 What do you do to stay disciplined? Do you actually enjoy all types of writing you do?